This is the Cardus analysis of the Government of Canadaâ€™s Budget for fiscal year 2010-2011, released by the Hon. James M. Flaherty, Minister of Finance, on Thursday, March 4, 2010. This budget continues to provide tangible short-term stimulus but leaves major questions about long-term demographic and social changes unanswered. It is uncertain whether this governmentâ€™s preoccupation with physical infrastructure will yield the long-term benefit we hope, especially as our social deficits become increasingly evident: a shrinking charitable core, an aging and urbanizing population and an increasingly competitive global environment are tomorrowâ€™s problems untouched in this budget. The Canadian recession was an international construction. It is in part the prudent policies of this and previous governments in Canada that mitigated its effects in our own economy, thinking that privileged long term sustainability over short-term indebtedness. The Canadian government joined the world in responding in last yearâ€™s budget; a response that, if anything, was more muted than most members of the opposition desired. But the panic has subsided. The Canadian economy is growing again, our banks have weathered what appears to be the worst of it andâ€”comparativelyâ€”the federal stimulus was modest and strategic enough that we need not feel overwhelmed by the long-term challenges. Changing fiscal realities mean a changing focus. This year the federal budget focuses on completing the initiatives announced last year in the Economic Action Plan, including $19 billion of federal stimulus to be complemented by an additional $6 billion from other partners (primarily provincial and municipal governments). The budget introduces a series of measures designed to â€œcreate the jobs and economy of tomorrow,â€ primarily through modest industry-specific initiatives along with a focus on reducing regulation and tariffs. Finally, the budget focuses on eliminating annual deficits, projecting a reduction from the current $53.8 billion to $1.8 billion in 2014-15. This will be accomplished through a three-part strategy: ensuring that the Action Plan expenditures are temporary and end as scheduled; curtailing $17.6 billion of spending growth with defence, international assistance, and government administration the primary areas of focus; and a program review intended to eliminate the lowest-priority and lowest-performing government programs. Are we getting what we paid for? Everyone who has invested money knows that the goal is to turn short-term liability into long term assets. Yes, Canada has fulfilled its international obligations and provided substantial stimulus to the global economy, but will we see long-term assets provide value and economic dividends? In short, did the Economic Action Plan provide value for money? Can we keep up with the payments? In particular, does this budget factor in ongoing maintenance costs? Demographic data being released suggests that our maintenance costs in health and social assistance may be far higher than anticipated, eating up what assets weâ€™ve managed to build in the long term. Does the plan to rebalance the books yet ensure the necessary investment to maintain our social and physical infrastructure? Can our income sustain this? Ultimately every buyer puts capital down with a certain margin of risk. The federal budget has projected GDP growth of 3.4% for the period 2009-2014. Are these assumptions realistic? In particular, are the plans for economic growth credibly taking account of the known demographic changes which are facing the country? 1. ARE WE GETTING WHAT WE PAID FOR? The critical question about the stimulus spending of the last federal budget is whether we have turned our deficit liabilities into assets. It is true that Canada joined a multinational network of states in injecting massive amounts of capital into global markets. Internationally speaking it is difficult to imagine another government forging a different track. But did we get strategic value for the manner by which we made those injections? This question is essentially about how the governmentâ€™s overall stimulus game plan is working. The answer is mixed. 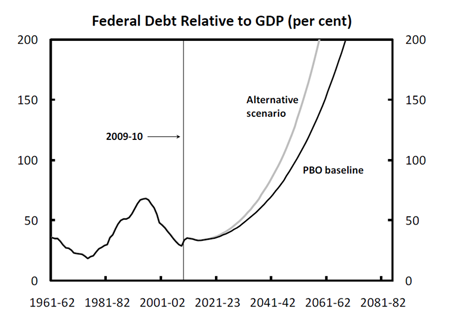 In the first place, recent projections of federal debt relative to GDP suggest an alarming trend. The government rightly points out that Canadaâ€™s debt to GDP ratio is the lowest in the G7 but short-term comparisons do not address what could be a long-term trend. Second, the what of our investment is as important as the how. The federal governmentâ€™s stimulus spending has rightly focussed on physical infrastructure, long term projects which will serve Canada and its future well. The return on these projects is measurable and effective. Yet, physical infrastructure is only partâ€”if a critical partâ€”of the picture of Canadaâ€™s future. Economic growth depends both on the foresight of physical and social infrastructure to sustain it. This budget does provide $1 billion to support deferred maintenance repair and construction at our colleges and universities. It also invests in ports, bridges, and energy projects. However, it neglects to sustain our equally vital social architecture. It neglects worrying trends in Canadian culture, like our dwindling civic core; the 6% of Canadians who volunteer and donate at disproportionate levels. It leaves fundamental questions about looming demographic challenges in health care, elderly care, social insurance, labour shortages and more unanswered. 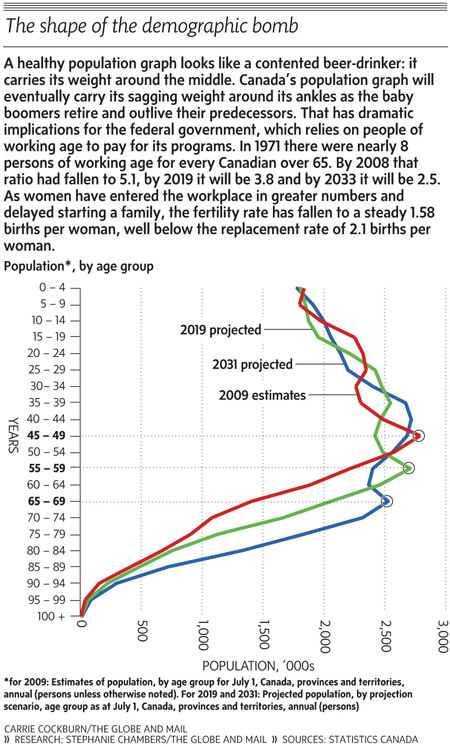 Many elements of long-term projections are uncertain, but the demographic transition that is underway in Canada is not. Canada may be getting short-term value for its dollars, but in the long-term we may have wished weâ€™d diversified our portfolio. 2. CAN WE KEEP UP THE PAYMENTS? The â€œnew population bomb,â€ as Foreign Affairs put it in January, is as global a crisis as the recession. And these phenomenon are not disconnected. The proportion of GDP produced by Europe, the United States and Canada fell from 68 percent in 1950 to 47 percent in 2003 and is expected to decline further. If the growth rate of per capita income (adjusted for purchasing power parity) remains the same from 2003 to 2050 as it was between 1973 and 2003, then Canadian GDP will double by that date. The rest of the world will grow by a factor of five. The global proportion of GDP produced by Europe, the United States and Canada in 2050 will be less than 30 percentâ€”smaller than in 1820. The question is not merely can we pay for the stimulus of physical infrastructure, but can we afford not to attend to the looming questions of social architecture? A shrinking charitable core, an aging population, a dwindling labour pool and soaring foreign economies present the challenge not simply of the next fiscal year, but of the coming decades for Canada. Ultimately, the cost of ignoring these demographic swings may prove far higher than the short-term physical stimulus. In October 2009, a study by Cardus entitled A Canadian Culture of Generosity Â pondered the implications of Canadaâ€™s impending social deficit: how our institutions are going to suffer from the steady decline in charitable giving, volunteering and civic engagement. The study showed how a relatively small proportion of the populationâ€”dubbed the â€œcivic coreâ€â€”provides the vast majority of needed resources in the charitable sector. A major concern is that this civic core is declining by 1-2 per cent per year, raising obvious concerns regarding what this social infrastructure will look like a decade from now. In February 2010, Cardus added to this analysis a careful look at The Shifting Demand for Social Services, revealing trends in demographics, immigration and urbanization that will put exponential pressure on Canadaâ€™s social infrastructure, charitable organizations among them. In 2001, one in eight Canadians was over the age of 65. By 2026, it will be one in five; by 2030 one in four. An increasing proportion of the population will be asked to care for the elderly. We will, of course, continue to rely on immigration. But the programs that assist integrationâ€”settlement and language trainingâ€”are driven by non-profits. It is projected that the immigration populations in Canadaâ€™s cities will increase by about 10% between 2001 and 2017; few of them coming from French and English countries. This year will be the first time in history that the majority of the worldâ€™s population will live in cities rather than in the countryside. Whereas 30 per cent of the worldâ€™s population was urban in 1950, according to U.N. projections, more than 70 per cent will be by 2050. The same U.N. studies suggest that the relative demographic weight of the worldâ€™s developed countries will drop by nearly 25 per cent, shifting economic power to the developing world; the developed worldâ€™s labour will age and decline, constraining growth and raising demand for immigration; and most of the worldâ€™s population growth will be concentrated in the cities of todayâ€™s poorest, youngest and most religious countries. The net impact is a concentrated upward surge in the demand for social services, just when we in Canada are least able to meet that demand. And we are not alone. These alarming shifts are at the heart of every long-term economic projection in the developed world. which Canadians rely on for our present assumed standard of living. But collectively this amount to very little in the context of a looming problem. This budget ignores the well-known warning signs regarding the demographic challenges we face. 3. WILL OUR INCOME GROW ENOUGH TO SUSTAIN THIS? It is impossible to say, with certainty, that government projections for return on investment are either correct or incorrect. However, given what we can expect demographically it is worth considering whether even our most optimistic projections of GDP growth and economic expansion will be capable of both absorbing this extra burden and bridging the gaps made by strong stimulus spending. Fiscal sustainability, to say nothing of return on investment, requires looking beyond the medium term projections of a sitting governmentâ€™s budgetary balance or debt. It is not an academic exercise to plan for a coming demographic shift; it is prudent management. This is being recognized by more OECD countries, who being alerted to similar demographic trends are beginning to routinely prepare long term fiscal projections. The infamous inverted demographic pyramid will catch up to Canada too, if in a longer term manner than other countries like Japan. The government is returning to the Advantage Canada framework relying on tax, fiscal, entrepreneurial, knowledge and infrastructure advantages to position our economy favourably. As we noted in our analysis of the 2007 budget which was framed around this model, the missing component in this strategy is building the capacity in non-governmental institutions. While there are various specific measures that, if properly implemented, have merit and will assist particular subsectors of the economy, for the most part this is a â€œtinkering with the status quoâ€ budget that trusts market forces to solve the problem. On the one hand this is commendable: market forces are more reliable innovators than government programs. On the other hand, markets require workers and consumers. Our argument is that the foundation of the Canadian market itselfâ€”which depends on the complex system of Canadaâ€™s social architectureâ€”is facing serious problems that cannot be fixed overnight. This is a good budget, but itâ€™s not visionary. Canada will begin facing down critical problems in the coming decades that need visionary fiscal leadership, leadership that looks beyond the short-term physical stimulus that this and the previous budget have competently provided. The sage advice, â€œdonâ€™t panicâ€ is right about this budget. Short term, it will serve Canada in a variety of important ways. It is not blithely delivered nor fundamentally unsound for our moment in economic history. But it has the seeds of future challenges: the investments weâ€™ve made with our recessionary largess may not be worth what we think they will, the ongoing costs of maintenance are certainly far higher than this budget suggests and the tab is going to be picked up by fewer and fewer of our children.